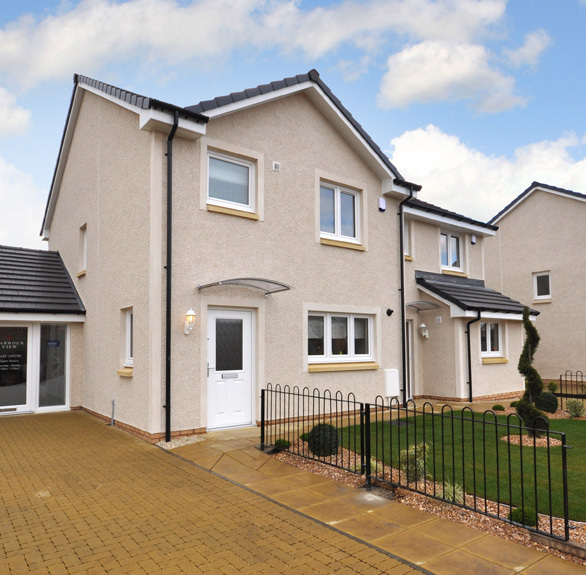 HELP TO BUY* ON EVERY STEP OF THE PROPERTY LADDER, NOW AVAILABLE WITH LOCHAY HOMES! You could only need a 5% deposit and a 75% mortgage to 100% own a new home. Help to Buy* and Help to Buy (Scotland)** are new Government-backed schemes to help buyers secure a mortgage on a new build home. It means that home buyers can own a home with only a 5% deposit, and gain help funding up to 20% of the purchase price. And remember that these initiatives are available to all buyers, not just first time buyers. With Help to Buy*, you’ll receive an equity loan from the Homes and Communities Agency (HCA) to help you secure a mortgage. With Help to Buy (Scotland)**, you’ll receive an equity loan from the Scottish Government. The schemes have been designed to assist those who would be able to sustain a mortgage, but who cannot currently acquire one due to large deposit requirements. Help to Buy* and Help to Buy (Scotland)** offer up to a maximum of 20% of the purchase price through an equity loan funded by the English and Scottish Governments. The remaining 80% is then made up through a 5% deposit contribution and a 75% mortgage from a bank or building society. So Help to Buy* means precisely that. *Help to Buy is available on properties up to a maximum value of £600,000 in England. If you qualify for Help to Buy assistance and you raise a mortgage for at least 75% of the purchase price of your new home from a lender, you can borrow up to the remaining 20% of the purchase price by taking out a loan secured over your new home from the Government’s Homes & Community Agency (HCA) over a period of 25 years. A 5% deposit is required by the lender. More may be required depending upon circumstances and your lender’s criteria. Help to Buy is subject to eligibility and terms and conditions. Terms and conditions apply. **Help to Buy (Scotland) is available on properties up to a maximum value of £400,000. If you qualify for Help to Buy assistance and you raise a mortgage for at least 75% of the purchase price of your new home from a lender, you can borrow from 10% to 20% of the purchase price by taking out a loan secured over your new home provided by the Scottish Government. Security over your new home required. A 5% deposit is required by the lender. More may be required depending upon circumstances and your lender’s criteria. Help to Buy (Scotland) is subject to eligibility and terms and conditions. Terms and conditions apply.